For generations, the North Carolina Folklore Journal has served as a chronicle and sounding board for the likes of Belled Buzzards, shape-note singing, and sweet potatoes. If it’s part of folklife, more than likely it’s been found between the pages of a journal that has been published continuously since 1954. 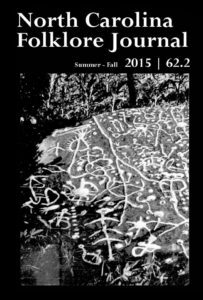 Recent issues have featured essays on “Fish Stew and the Washington Day’s Fox Hunt at Albertson, NC” by Leanne E. Smith; “Appalachian Beastiary” by Gary Garden; and “Cherokee Rivercane Baskets” by M. Anna Fariello. Most issues can be read for free, here. Unsolicited pitches and manuscripts may be sent to the editor at any time via e-mail: ncfolklorejournal@gmail.com. The Journal regularly accepts reviews of nonfiction books and documentaries. While the Journal does not publish fiction pieces, occasional poems of twenty-five lines or fewer, including spaces, may be accepted, along with some reviews of fiction writing and film if the reviews address works’ portrayal of NC culture. Reviews of books, albums, documentaries, other media, etc., may be approximately 1,000-1,500 words. Manuscripts should conform to MLA Style. Please use parenthetical citations in the text of articles (endnotes are fine, too, if necessary), and include a works cited list for sources. Since 1913, the North Carolina Folklore Society has “worked to promote and celebrate North Carolina heritage.” They support “practitioners and professionals, and honor the our state’s culture through publications and awards,” including the Brown-Hudson Folklore Awards and the community Traditions Awards. The North Carolina Folklore Society can be found on Facebook here. To learn more about the journal, visit http://ncfolkloresociety.org/journal. This was written by charles. Posted on Tuesday, June 13, 2017, at 5:45 am. Filed under Uncategorized. Tagged gary carden, leanne e. smith, literary magazines, m. anna fariello, nc folklore journal, nc folklore society. Bookmark the permalink. Follow comments here with the RSS feed. Both comments and trackbacks are currently closed.